The Dogwood Initiative - U.S. tax returns show that in 2008 and 2009, Tides Canada granted $US 87,293 that was specifically ear-marked for the Dogwood Initiative's coastal tanker campaign. 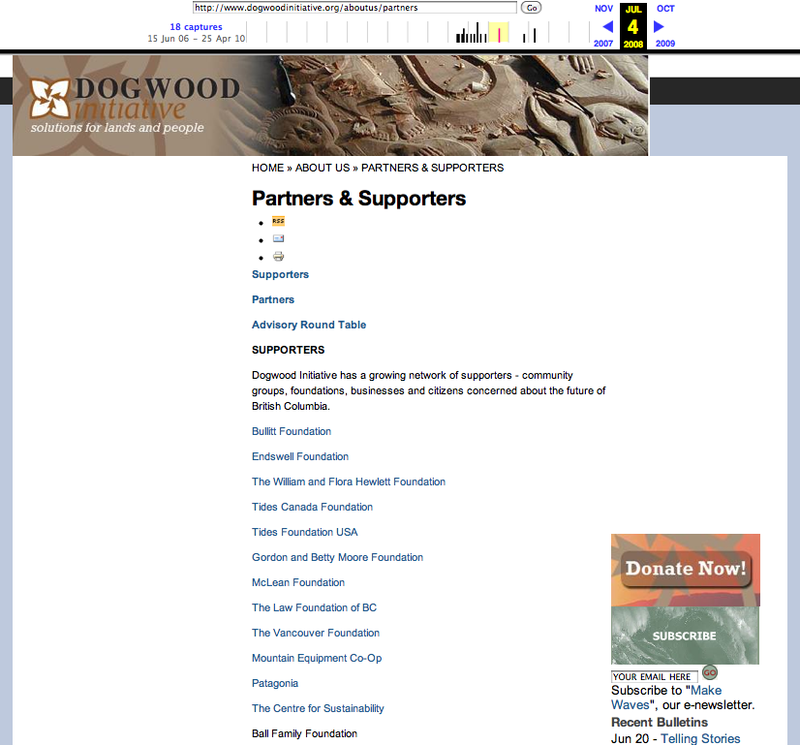 Since Dogwood re-designed its web-site, its list of its partners and supporters is no longer found at its web-site. However, internet archives show that Tides Canada was listed among the partners and supporters of the Dogwood Initiative as of July 4, 2008. (Click here). (Note: As of July 2008, the William & Flora Hewlett Foundation and the Gordon & Betty Moore Foundation were also listed as partners of the Dogwood Initiative. These two U.S. foundations alone have granted $45 million to Tides Canada since 2000. Other documents show that Tides Canada was still a partner of the Dogwood Initiative as of March 3, 2011. For that document, click here. In 2009, Tides Canada paid $US 783,603 to Forest Ethics Canada and $US 848,966 for Rainforest Solutions, a joint project of Greenpeace, the Sierra Club and Forest Ethics. Tides Canada's CEO recently acknowledged that Forest Ethics is a project of Tides Canada. Tides Canada also paid $US 532,882 directly to the B.C. chapter of the Sierra Club. Forest Ethics, Greenpeace and the Sierra Club are all active in campaigns that seek to thwart the Canadian oil industry. Tides Canada also granted $US105,000 to Environmental Defence Canada Inc. for its "Toxic Tar Sands" project. I can not find one single environmental organization that Tides Canada has funded that is supportive of the Northern Gateway Enbridge pipeline. Over the years, Tides Canada has been granted at least $137,000 by the Seattle-based, Bullitt Foundation, according to the Bullitt Foundation's on-line database. In addition, Bullitt granted $US 564,000 to the U.S. Tides Foundation for projects of Tides Canada (eg. The Dogwood Initiative, Canopy, and the Tyee Solutions Society). One of the grants from Bullitt to the U.S. Tides Foudnation was $US 30,000 "... to mobilize urban voters for a federal ban on coastal tankers ..." Shortly after I testified about this grant to a House of Commons Standing Committee in December of 2010, Bullitt quietly re-wrote this grant. (American foundations aren't supposed to mobilize voters in a foreign country). Bullitt also granted $US 30,000 to the Dogwood Initiative, another project supported by Tides Canada, "to strengthen and enforce a 34-year moratorium on oil tanker traffic in the mid and north coast of British Columbia, and to prevent expansion of oil and gas infrastructure in Georgia Strait and the lower Fraser Basin." The Brainerd Foundation has paid at least $US 71,000 to the Dogwood Initiative, including $3,000 specifically ear-marked "To help grow public opposition to counter the Enbridge pipeline construction and the risk associated with increased oil tanker traffic in B.C. 's north." Brainerd also granted at least $US 80,000 to Tides Canada during 2007 and $80,000 from 2002 to 2004. Since 1999, Wilburforce has granted at least $21 million for environmental campaigns and initiatives in British Columbia and Alberta. None of the recipient organizations are favorable to the Enbridge pipeline and the development of the Alberta oil industry. Of the $26 million, at least $US 536,000 was for projects that specifically mention oil, fossil fuels, energy or the Dogwood Initiative. Wilburforce also granted at least $4 million in support of the Great Bear Rainforest Initiative. In 2004, Hewlett paid Tides Canada $70,000 to develop a "strategic plan to address oil and gas development in British Columbia. Since then, Hewlett has poured $26 million into various projects to tackle the Canadian energy sector. Hewlett has paid at least $14 million directly to Tides Canada for various projects, particularly in conjunction with the Great Bear Rainforest and the north coast of B.C. Internet archives show that Hewlett has been listed as a supporter of the Dogwood Initiative though no grants specifically for the Dogwood Initiative have been found. Hewlett's Environment officer has referred to the Alberta oil industry as "a nasty business." In an interview, he once said, "One place where all our worries come together is in northeastern Alberta, Canada. There, in an area the size of Florida, is a massive deposit of oil mixed with sand. It's the second largest oil reserve after Saudi Arabia, and work has begun to extract it. Processing these so-called tar sands is a nasty business that involves large amounts of water and natural gas. It's hard to imagine a worse situation." The web-page with that statement was removed from Hewlett's web-site after it was mentioned at this blog. For a .pdf of this web-page, click here. Since 2005, Tides Canada has accepted at least four grants from the Oak Foundation ("Oak"). Oak has granted US$16-million to Canadian environmental organizations since 2005, including US$900,000 to Tides Canada. Oak's grants include US$97,000 paid to the West Coast Environmental Law Research Foundation "to constrain development of Alberta's tar sands by establishing a legislative ban on crude oil tankers on British Columbia's north coast... The desired result would be a permanent legislative tanker ban and cancellation of the Enbridge Northern Gateway Pipeline," Oak says at on-line. Oak also paid US$300,000 to Forest Ethics USA. Oak says that with Oak funds, Forest Ethics will work with at least ten Fortune 500 companies to publicly disavow Tar Sands fuel. With Oak Funds, Forest Ethics will also "work with at least one of these companies to exert influence within the US Government to support regulations that will disadvantage Tar Sands fuel" and will "stop Enbridge's proposed Northern Gateway pipeline." Forest Ethics Canada is a project of Tides Canada. Oak also paid US$436,675 to Greenpeace Canada for a project titled, "Phase Out Tar Sands Campaign" and US$424,373 to Greenpeace Canada for another project titled, "Stop the Tar Sands Campaign." "Greenpeace Canada will employ its unique strengths as a direct advocacy organisation to create controversy around the tar sands both within and outside of Canada. This will result in the withdrawal of two institutional investors from the tar sands by 2012; the disengagement of Norway's Statoil and Britian's BP from the tar sands project; and the end of tar sands subsidies from the Government of France," says Oak at its web-site. For their "Tar Sands Campaign," Oak also paid US$700,000 to the U.S. Tides Foundation in 2009 and US$426,857 to Environmental Defence Canada Inc in 2010. Last year, Oak paid Tides Canada US$200,000 to develop "a new energy vision for Canada" with "a plan and a pathway to reduce emissions by 80 percent by 2050." Oak also paid Tides Canada US$50,000 for an "Energy Initiative," including "a five-year strategic plan to begin to convince Canada to accept the long-term goal of dramatically lowering the country's GHG emissions." As part of this initiative, Tides Canada will "determine the feasibility of creating a Canadian Energy Fund, similar to the Energy Foundation, with a budget of up to US$30-million sourced from 100 to 200 high-net worth Canadian and international donors," Oak says. Would the Bullitt Foundation, the Brainerd Foundation, the Wilburforce Foundation, the Hewlett Foundation and the Oak Foundation have funded Tides Canada - millions of dollars over the past decade - if Tides Canada has, as it says, no position on the Enbridge pipeline and the Alberta oilsands? Would the Oak Foundation have funded Tides Canada to develop "a new energy vision for Canada" and a pathway to reduce emissions by 80 percent by 2050, if Tides Canada has, as it says, "no position" on the oilsands?